If you sign up for my newsletter, I’ll send you a free short story, A Hot Time in Dew Drop, Texas. Send your e-mail address to carolynrwilliamson@charter.net and put “want free story” in the subject line. You’ll get updates on my new books and short excerpts from the next one coming out. CLICK HERE to browse my books on Amazon.com. Music at this annual festival sponsored by MSU (that’s Mississippi State University, not Michigan State University, my alma mater) resounded from the auditorium walls. 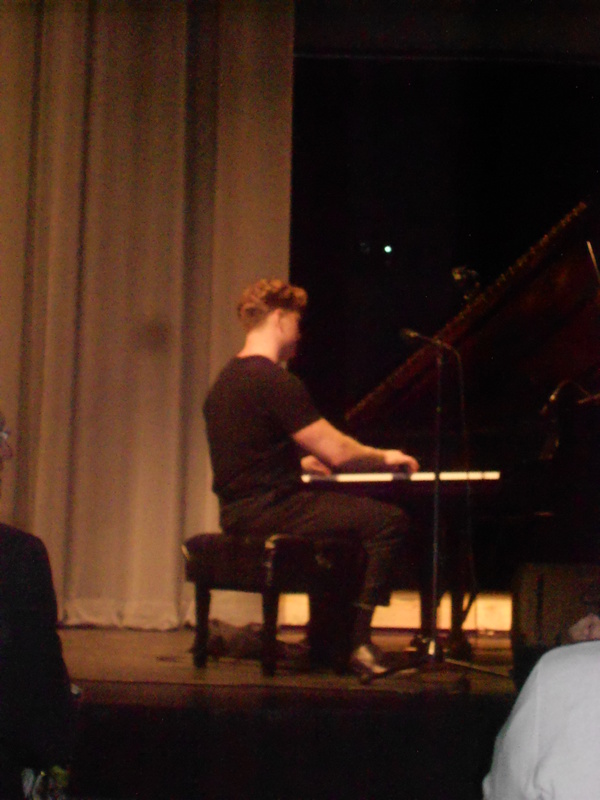 Concert artists played compositions from Jelly Roll Morton and Scott Joplin, as well as other composers, including some of the artists performing. Musicians used piano, drums, clarinet, and even a twelve-inch piccolo trumpet to create melodious sounds during two March evening concerts. Performers came from California, Pennsylvania, Louisiana, Michigan, and Mississippi. 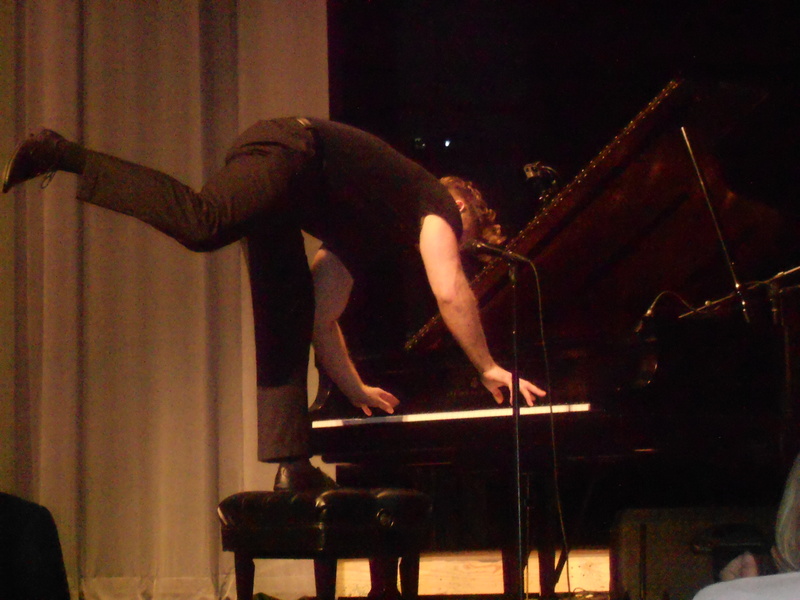 I was impressed by the drummer, Hal Smith, who’d practiced with some pianists, but sometimes cocked his ears to listen to a different pianist for a few minutes, then created his own routine to accompany the artist. 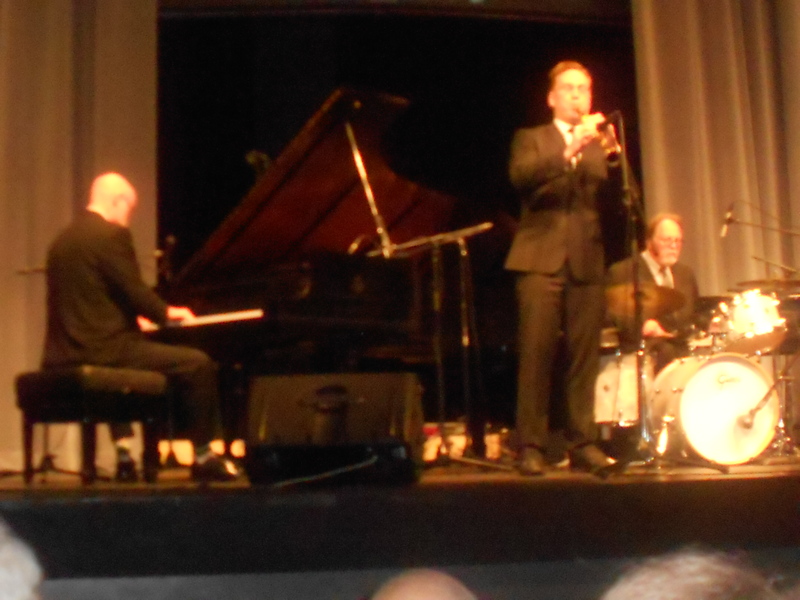 Dave Bennett, who’s been compared to Benny Goodman, played a staid accompaniment to pianists on the clarinet, although you could see his knee and shoulders moving in time with the music. But then, he took to the piano to play “A Whole Lot of Shakin’ Goin’ On,” by Jerry Lee Lewis, and gyrated all around the piano bench. Martin Spitznagel, tired of being asked to play Scott Joplin’s “The Entertainer,” demonstrated how it could be played in waltz time and and other variations. After reading about these musicians in the program, I realized ragtime and jazz are still played all over the country. 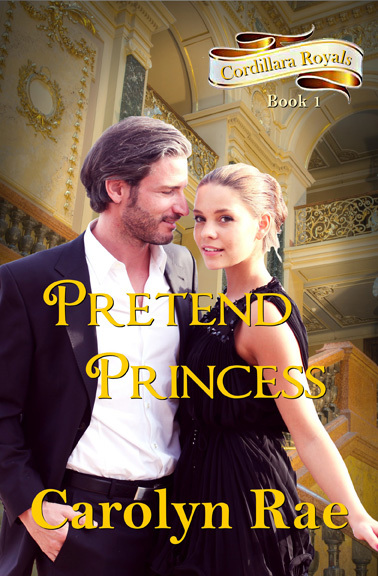 Now, that I’m back in Texas, I am getting ready to launch my revised and expanded version of Pretend Princess, which will become the first book in my new series, The Cordillera Royals. 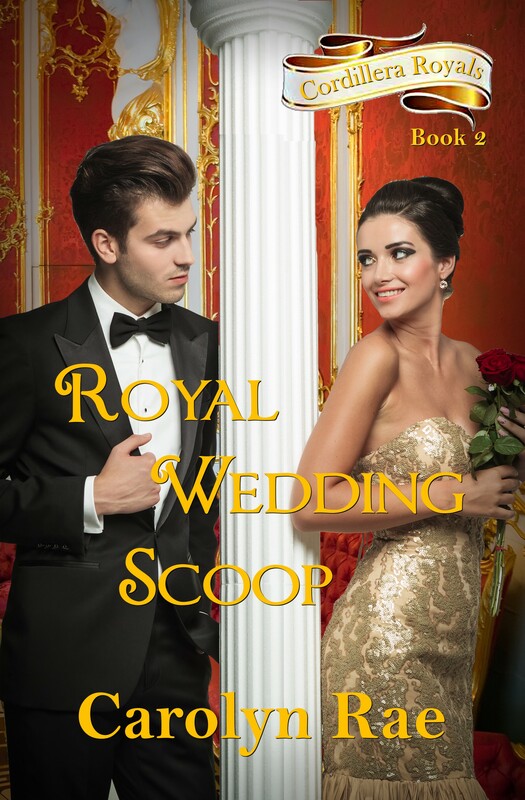 The next book will be Royal Wedding Scoop, featuring reporter, Danielle Dawson, who enjoys her favorite treat, chocolate filled croissants, but finds it hard to believe a prince might choose her over all the beauties he has dated. Wow. A chance to see part of a coral reef. I couldn’t wait. I was attending the Fun in the Sun Cruise Conference, sponsored by the Florida Romance Writers as a speaker. I’d prepared my speech on How to Write More and Faster, so the only thing I was nervous about was using the snorkel mask. Keeping up with my roommates on the long walk down the main hall to reach classes made me breathe a little harder–I have high blood pressure in my lungs–but as soon as I reached the classroom and caught my breath, I was fine. I’d swum across a lake and gone snorkeling about ten years ago, so I should be able to handle this. 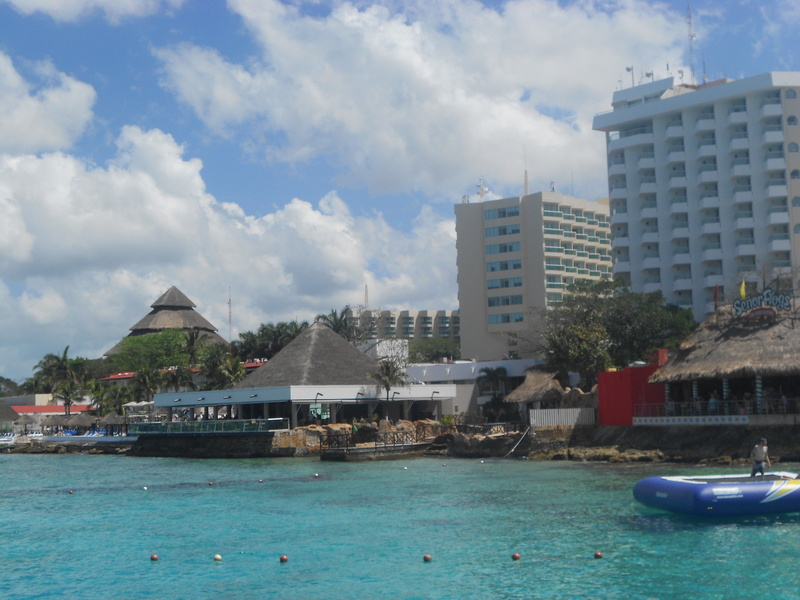 I made the long trek along the dock from the ship to the meeting place in Cozumel and slathered on sun screen along with others waiting to go. With my camera, hat, and towel, I followed others onto the boat and sat while we cruised the shoreline. The water rippled in patches of blue, green, and aqua as we passed a canal and a large hotel. I listened to the instructions for the mask and put on the flippers. Breathing with the mask took getting used to. I had to remember to breathe through my mouth and not my nose. 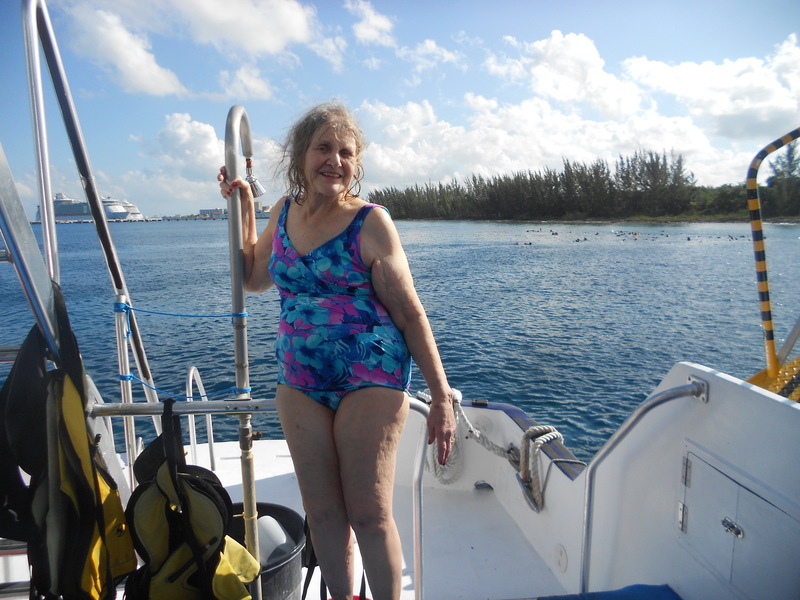 Walking with those huge flippers was tricky, but I followed other swimmers to the edge of the boat and jumped off. After surfacing, I swam about twenty yards toward the swimmers. I’d put my mask on when I reached them, but I was getting tired already. Suddenly, I remembered the last time I swam in a pool. I’d have to stop and rest after doing each lap. Now, it dawned on me. I was out of shape and not able to handle this. Damn. I was not going to see any coral reef. I turned and headed back toward the boat. One of the guides showed up beside me with a life-preserver ring, which I held on to conserve my strength as I swam back to the boat. 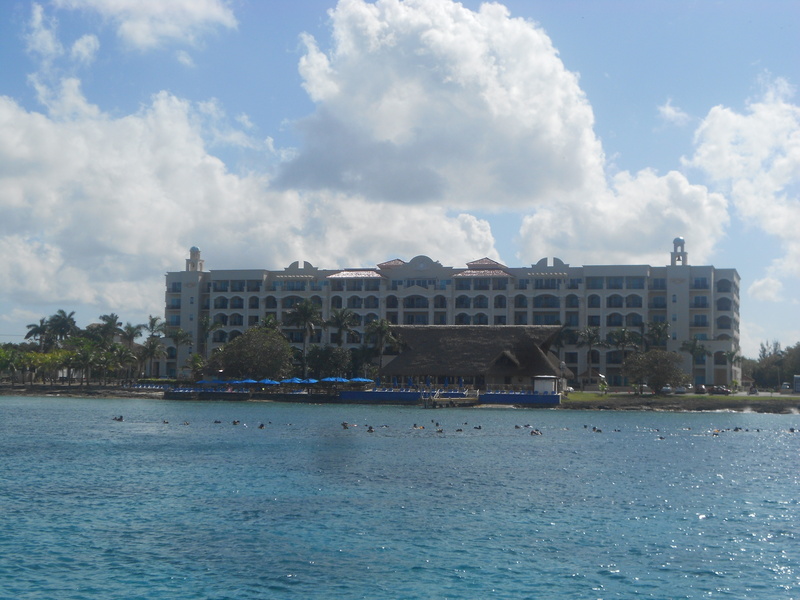 All the black dots you see in the water in front of the hotel are swimmers’ heads. Once on board, I relinquished my mask and flippers. I sat in the boat and watched the bobbing heads of the crowd of swimmers as they looked at the reef. After they returned to the boat, I asked a boy what he’d seen. He said he’d watched a lot of fish swimming. After returning to the cruise ship, I had several consolations. Dinners with fellow writers were delicious, and my speech went fine. I learned a lot from the classes on marketing and received a request for two chapters of my novel, Double Jeopardy, from an agent. Best of all, I was able to visit my brother and his wife at their home in Jensen Beach and see his pictures of fish and coral he’d taken while deep sea diving. Now, I’m back to polishing my chapters and finalizing the versions of the three novels I am republishing as a serial. The Royals of Cordillera will include Royal Pretender, Royal Wedding Scoop, and Holiday with a Royal. I have received preliminary covers for all three and will soon release Royal Pretender with Royal Wedding Scoop coming a month later. The first book in the Cordillera Royals Series. My writer’s group was having a dessert potluck. 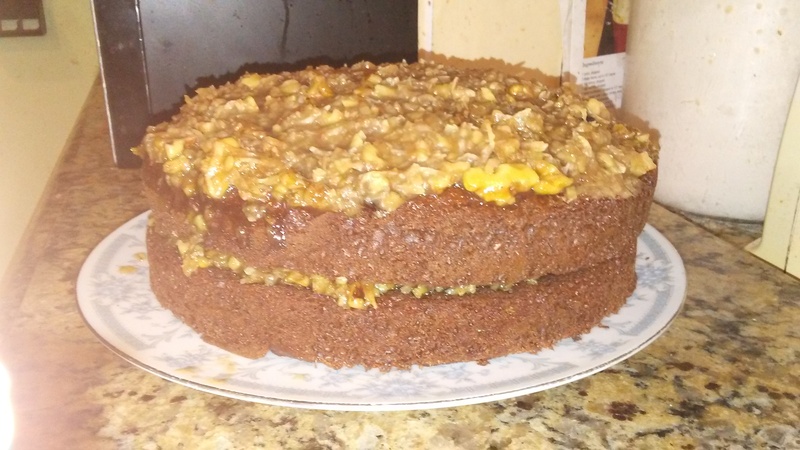 Now I could bake a cake to bring, because baking a cake for just me and my husband will not help us stay on our diets. However, things did not go smoothly. First, the spray I used to grease the pans came out in blobs. Hopefully, they would smooth out with batter being poured into the pans. 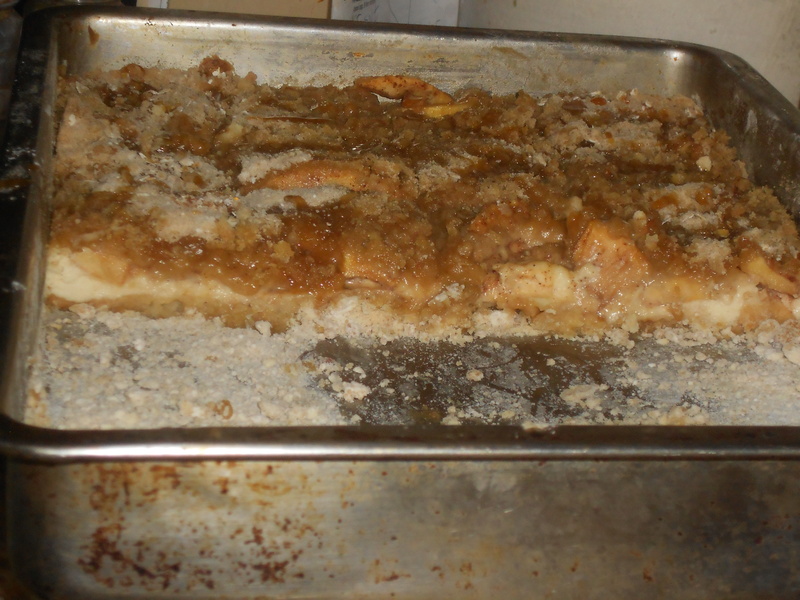 Not only did it not spread out smoothly, but it made the finished cake look mottled in places. Thank goodness, I could frost the cake to cover that up. After reading the notes I had written on the recipe card, I made sure to leave the margarine in big chunks, so the egg yolks would heat slowly and not curdle. Sometimes, when I’d made this frosting, it had turned out so runny I had to chill it in the refrigerator before it got thick enough to spread without running over the edges. I kept the heat on medium, so the frosting would cook slowly and thicken. It did thicken, but when I beat it, I realized I must have cooked it too long, for now it was too thick to spread. I added a little water, but apparently I added too much because I had to cook the frosting longer to get it thick again. Finally, when it was close to the right consistency, I began to spread it on the cake. I should not have skimped on the coconut to avoid a trip to the store, because there was barely enough to cover the layers. With about forty writers bringing brownies, cookies, and refrigerator desserts, to the potluck, there was a lot to choose from. However, the cake was popular with the writers, so I only brought home half a cake. Combine 1 cup of sugar, 3 egg yolks, and 1 teaspoon vanilla in a small saucepan. Add 1/2 cup margarine, cut in chunks. Cook and stir constantly over medium heat until thickened, about 12 minutes. Remove from heat and add 1 1/3 cups flaked coconut and 1 cup chopped pecans (or walnuts). Beat until thick enough to frost cake. If still runny, chill in the refrigerator. Makes 2 1/2 cups. Then I had to figure out what to do with the three left over egg whites. I could add them to scrambled eggs for breakfast for my husband, but he vetoed that. I put them in the refrigerator and delved into one of my cookbooks called, The Other Half of the Egg. I finally settled on adding another egg white and making meringue shells to fill with strawberries. Using a mixer, I whipped the 4 egg whites until foamy and added sugar, two tablespoons at a time, until I had added a full cup. Then I beat it until it was shiny and stood in peaks. On a large cookie sheet, I placed parchment paper (can use waxed paper or the clean inside of a cut paper bag spread out). I also made the edges raised. 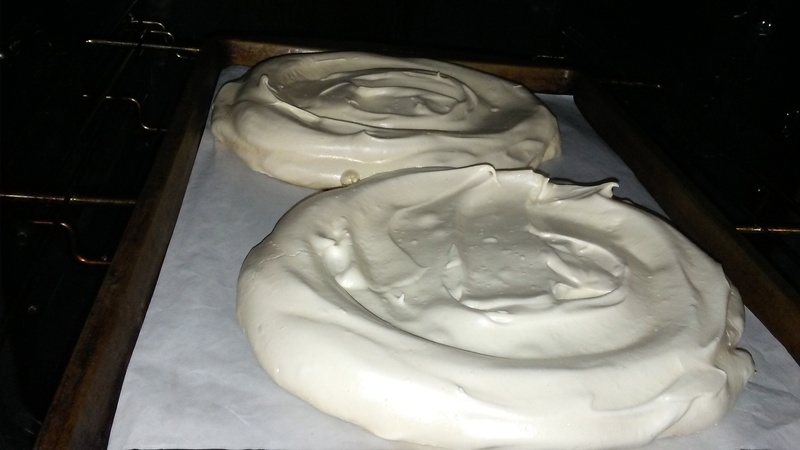 I spread the meringue in two circles about seven inches in diameter and baked in an oven preheated to 200 for 2 3/4 hours. I let them cool in the oven. Later, I spread 2 1/2 cups sliced strawberries mixed with 2 Tbs. sugar and 4 pkgs. Sweet ‘n Low and covered them with Cool Whip (can use whipped cream instead) on each layer. Then I stacked the second layer on top. 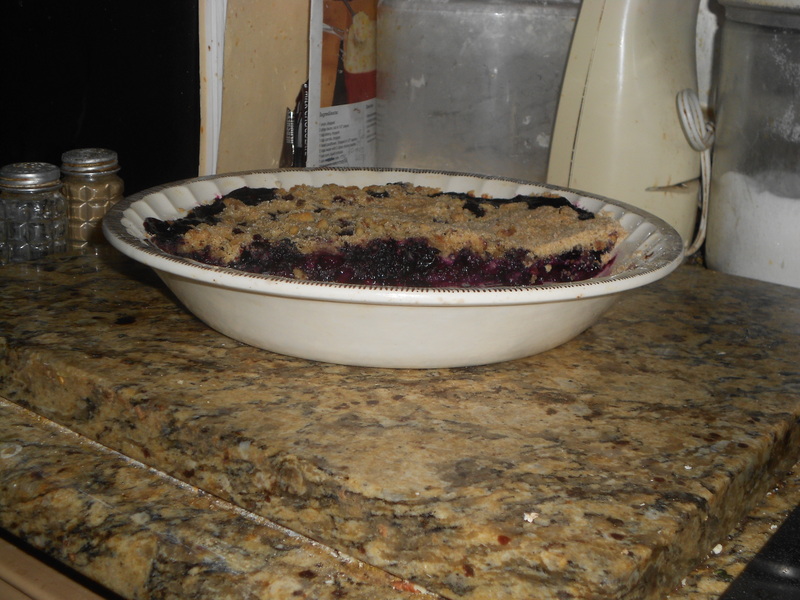 However, to cut serving pieces, I had to use a serrated knife and cut very gently. As my husband said, “Yummy.” Maybe next time I’ll serve one layer at a time. 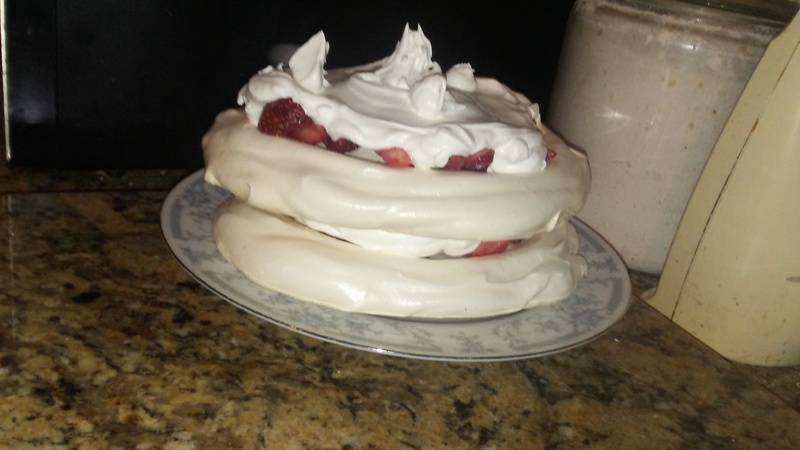 Sometimes, the meringue will weep, and you’ll need to sop up the liquid with a paper towel. 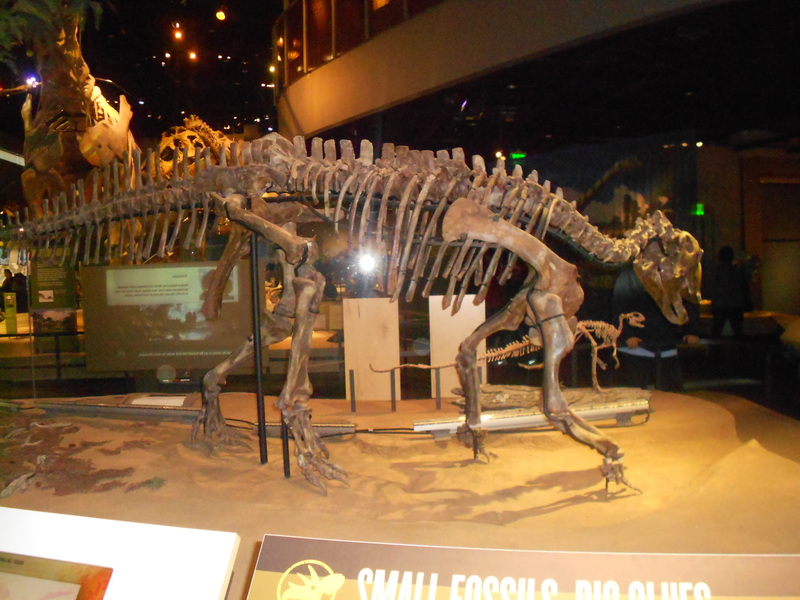 I visited the dinosaur exhibit at the Perot Museum of Nature and Science in Dallas. 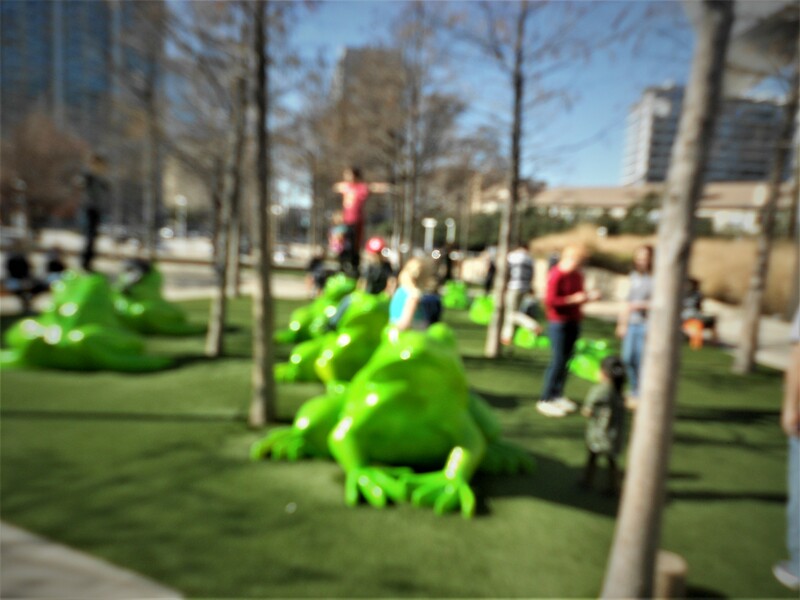 Outside sat huge frogs for children to climb onto. 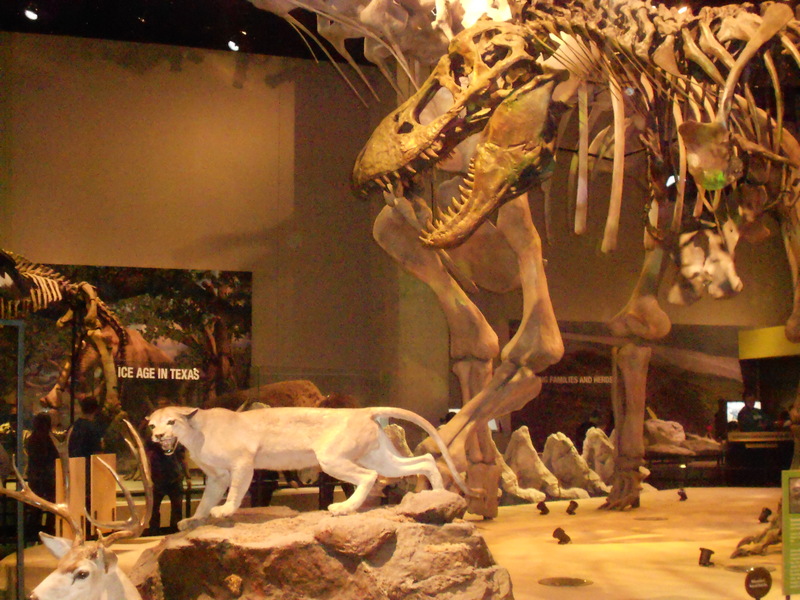 Inside the exhibit, a tyrannosaurus rex skeleton, found in Montana, is shown near a stuffed mountain lion, so you can realize how big that creature was. It ate meat, but herds of herbivorous dinosaurs roamed North Texas. Imagine having to eat enough plants to sustain a body that big. You’d be hungry all the time. The second picture shows the full skeleton of the tyrannosaurus rex. 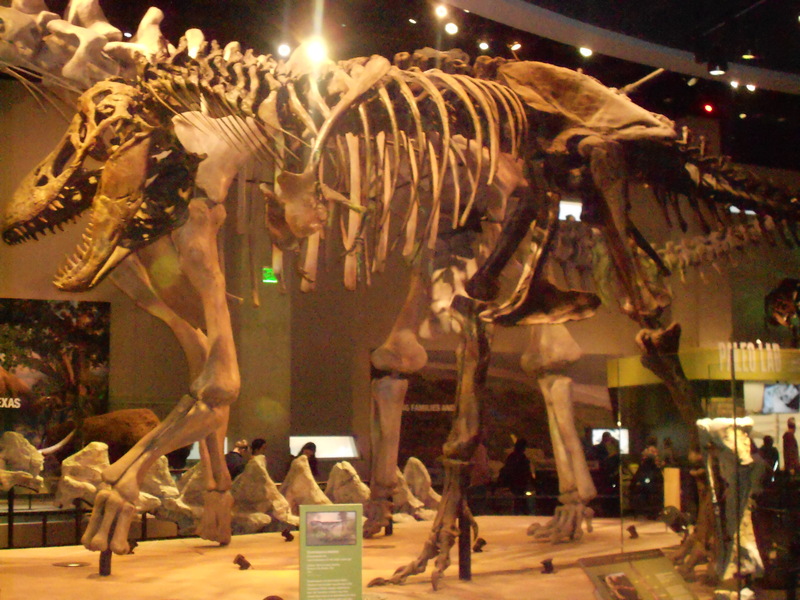 The largest complete skeleton found was 40 feet long. Several of the skeletons were found in Texas. I watched a 3D film about a dinosaur, which died 67 million years ago. It was strange seeing the neck and head of a dinosaur stretching out into the theater so close to me. I learned some dinosaurs could see as far as seven miles on a clear day. Potential prey would have a hard time hiding from them. The next picture is of a tenontosaurus from the early cretaceous period. The skeleton was found in Wise County, Texas. When archaeologists find bones, they cover them with burlap soaked in plaster, which dries. Then the bones are transported to be cleaned and assembled. At the museum, an archaeologist worked to remove dried soil from an artifact. The skeletons reminded me of a book by Russell Ferrell, The Bone War of McCurtain County, (2018) a true story of Arkansas hillbilly Cephis Hall and Choctaw Indian Sid Love, two backwoods naturalists who sought buried treasure and nature’s booty in the American South (Oklahoma). Their troubles began after they discovered and excavated a world-class dinosaur specimen on land owned by a major timber corporation, which propelled them into a drawn out conflict with the company and its friends in government and academia. Geologists blame Dinosaurs’ extinction on several likely causes, climatic change, diseases, changing plant communities, and geologic events. Perhaps a giant meteor that crashed into the earth near the Gulf of Mexico in the Chicxulub Crater near the town of Chicxulub on Mexico’s Yucatan Peninsula, caused dust clouds and carbon dioxide that blocked sunlight and killed plants and animals. The crater, which extends out into the ocean, is estimated to be 62 miles wide and 19 miles deep. The megasunami would have reached Texas and Florida. I also visited the Perot Museum’s extensive rock and mineral collection as well as exhibits on oil wells. It was amazing to see how far horizontal drilling can be extended beneath the surface to collect gas and oil. Parking was handy, but cost $10. General admission ranges from $13 -$20. 3DFilms are $6-$8. Tickets for $25-$30 include admission and two 3D films. Special exhibits like the dinosaur one cost extra. 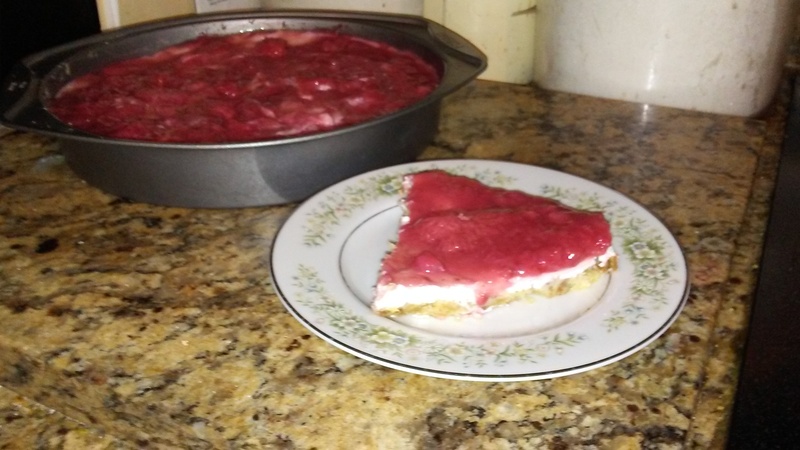 I made the pie recently to take to a meeting and discovered the amount of strawberries needed to be increased from the recipe I posted last. 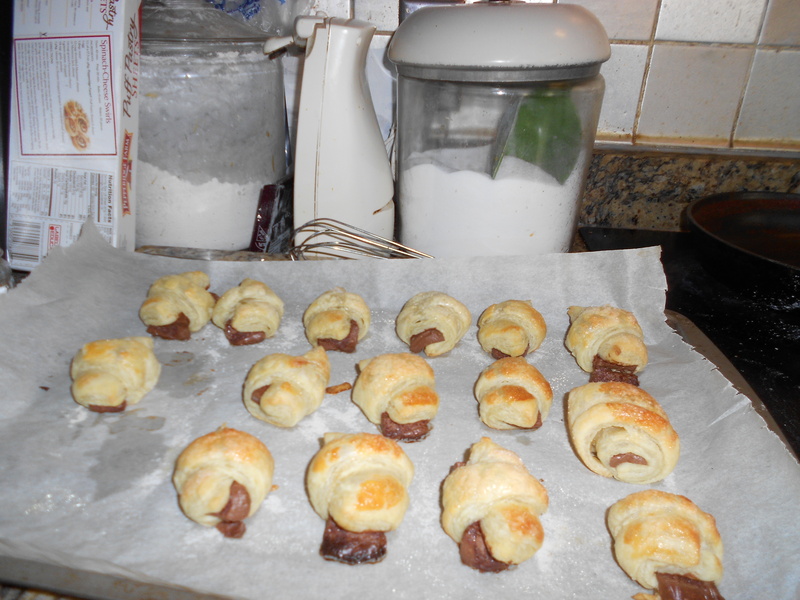 However, it turned out fine, and best of all, there was some left over to take home. See the picture below. I have copied the correct amounts for the recipe below. Prepare Dream Whip and fold that into the cream cheese mixture. Strawberry Filling Mix in saucepan and bring to a boil. (Boil one minute to eliminate raw cornstarch taste.) Let cool and spread over cream cheese mixture. Let chill two or more hours for flavors to blend. Cherry Filling If you are not counting calories or sugar grams, use 2 cans of Cherry Pie Filling instead of strawberries.